This page contains many of the most significant cases in UFO history. Opinions or theories drawn about these cases are the product of the individual author or organization. These files come from a variety of sources, and all source information was kept intact, therefore any and all copyrights are honored. This page is frequently updated so please come again. All of the case files written by B J Booth, webmaster of the UFO Casebook, are free to distribute with a link back to the Casebook. Notes: The categories displayed on the top of the table are presented for ease of selection of cases based on certain criteria. Many times it is difficult, however, to assess whether or not a physical trace or effect occurred. This effect can be many things, a beam of light, a radar confirmation, a broken tree branch, disturbed or damaged earth, soil impressions, a smell, a sound, electromagnetic effects, reaction from animals, i.e. anything relating to the object or humanoid in question. This designation is based on witness statements. The term "flying saucer" was made popular by a journalist covering Kenneth Arnolds's sighting of nine flying disks in June of 1947. The journalist misquoted Arnold, who did not describe the objects as saucer shaped, but describes their strange movement as similar to a saucer thrown on water and bouncing several times: they "flew like a saucer would if you skipped it across the water. "But a Texan farmer, John Martin, used the term "saucer" 69 years earlier to describe the flying object he saw on a hunting expedition in the surroundings of Denison, Texas, on January 2, 1878. In this case also, "saucer" does not refer to the shape, but to the size of the observed object, as its shape was described as that of a balloon. John Martin saw the dark object high in the Southern sky. He first noticed it to be about the size of an orange, that grew in size as it got closer to him. After he had to rest his eyes, it had increased considerably in size and appeared to be going quite fast. When it was over him it was the size of a large saucer and at a great height. Because this UFO was dark, and not a mysterious light, reflective, or silvery, many scientists believe he saw a solid object against the sky, with the light behind it.The sighting was reported by the local newspaper Denison Daily News on January 25, 1878, with the title "A Strange Phenomenon." The article was a first-hand report from the farmer, and its full text is:From Mr. John Martin, a farmer who lives some six miles south of this city, we learn the following strange story: Tuesday morning while out hunting, his attention was directed to a dark object high up in the southern sky. The peculiar shape and velocity with which the object seemed to approach riveted his attention and he strained his eves to discover its character. It seems that nothing on this earth could penetrate or damage the hull of this craft from another world. The disc shaped craft had large metallic rings revolving around a central core, which was supposedly the control bridge of the object. The hull of the craft contained no apparent seams, rivets, or any hint of the material being pieced together. As the story goes, the investigating team gained access to its interior by the use of a long pole which they pushed through a porthole in the saucer. A knob was engaged which opened a previously hidden door. Once inside, the team found 16 small humanoid beings, all dead, their bodies charred from fire. The aliens height was reported as 36-42 inches. The exterior of the craft was not damaged. The inside showed that the craft was put together with a framework of grooves and pins. The craft and the alien bodies were allegedly sent to Wright-Patterson Air Force Base. Other supporting evidence of the Aztec crash was said to have surfaced in 1987 from one William Steinman, but his sources were never verified. Steinman asserted that the crash occurred on March 25, 1948, and was verified by three different radar stations. Steinman's account listed 14 dead aliens instead of 16. Until supporting evidence of Scully's or Steinman's account can be obtained, the Aztec crash story remains an unsolved mystery. Many reports of UFO encounters made by single individuals are often given little weight by most investigators. However, when that one person is of high esteem and credibility, the case is given much weight. Such is the case with an Alien encounter that occurred in 1950 in South America. The lone witness was Dr. Enrique Caretenuto Botta, who passed his incredible story on to Horacio Gonzales G. in Caracas at a UFO conference in 1955. Dr. Botta would soon give permission to Horacio G. to relate the story to famed UFO researcher Leon Stringfield. The researcher would release the details of the Botta encounter in his book, "Situation Red." Botta was driving down the highway about seventy-five miles from his hotel in an isolated area known as Bahia Blanca when he saw a metallic, disc-shaped object sitting on the grass just off the road way. He stopped his car to watch the object for a few minutes to see what would happen. After seeing no sign of movement, he decided to get even closer to the unknown object. This vantage point allowed him to see an opening or doorway in the object's side. He decided to go inside. At first the craft's inside seemed empty, except for a blinking red light in a domed top. As he ventured farther inside, he saw a curved divan with four seats; three of these seats were occupied with small beings about four feet tall with gray, tight-fitting overalls. The three small creatures were facing a control panel. It consisted of lights, gauges, and meters of different types. Standing quietly behind them, Botta could not resist the urge to touch one of the small beings. As he did, he felt a rigid, charred texture. The three strange creatures were dead! 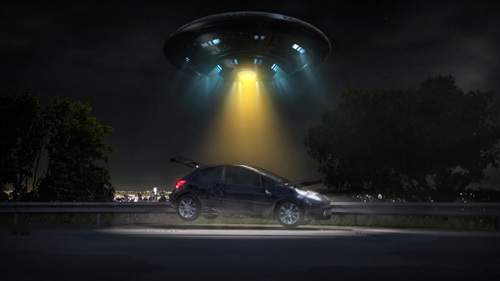 All within a moment, he rushed from the saucer, got into his car, and was speeding down the highway. Arriving at his hotel, he related his strange experience to two of his closest friends. The group of men armed themselves with weapons and decided to return to the scene of Botta's encounter. However, it being almost dark, and the area being so isolated, they changed their minds, and opted for the next morning to do their search. Early the next day, Botta led the three directly to the spot of the previous day's unusual encounter, but there was no craft there now. All that was found at the site the object had occupied was a pile of ashes. One of the men scooped some up. Immediately, his hand turned purple, and remained that way for several days. The three men, discouraged by the absence of the object, began to look around the area to see if any other evidence of its landing could be found. Dr. Botta would later relate more details of his observations on the day of the incident. He would recall that he saw vents or holes in the floor of the object. The control panel had a transparent sphere above it which rotated. The rigidness of the aliens' skin was an indication to him that they had died in a crash or malfunction. He also was amazed at the skin of the saucer, which was metallic in appearance, but had a "rubbery" feel to it. The 1946 case, more than anything else, is memorable for its characters. The legend goes something like this; In 1946, General James H. Doolittle was sent to Sweden by the Shell Oil Company, supposedly to investigate the mystery of the "Ghost Rockets." Why an oil company would investigate UFOs is beyond my understanding. Unless they felt they could strengthen their profits somehow. Somehow, he supposedly wound up in Spitzbergen. There are a number of Internet sites which claim that there was a short lived article published in America of a UFO crash in the Norwegian city about this time. Some people claim to have seen the article. The really odd thing about the tale of this case is the question must be asked what does Doolittle have to do with anything, since he is only mentioned as being in the area, and that is the end of his involvement. Some investigators claim that since no mention of the name Spitzbergen was found in the reports, that the location's mention was to cover up a crash in Great Britain. A crash in Great Britain during the same time period has no basis in fact either. In addition to being a game show regular, Kilgallen also was a journalist of a sort, having written "gossip columns," but she also was well known for covering hard current events. She had covered the headline grabbing Lindbergh kidnapping story. In the 1950s, she had covered one of the top stories of her time, the Sam Sheppard murder trial. Her last real claim to fame was in the 1960s when she got an interview with Lee Harvey Oswald killer Jack Ruby. This interview was carried by the "Los Angeles Examiner." She told friends that she had information that would "break the case wide open." On 8th November, 1965, Dorothy Kilgallen, was found dead in her New York apartment. She was fully dressed and sitting upright in her bed. The police reported that she had died from taking a cocktail of alcohol and barbiturates. The notes of her interview with Ruby and the article she was writing on the case had disappeared. Luckily, she had given a friend a draft of her interview. Kilgallen was probably fearful for her own life, since several other writers who had worked on the Oswald / Ruby case had died under "unusual circumstances." The other Spitzbergen crash story first appeared in the German newspaper “Saarbrücker Zeitung” in June 1952. The article, entitled "Auf Spitzbergen landete Fliegende Untertasse", was soon picked up by several other German newspapers, with many of them citing “The Stuttgarter Tagerblatt” as the original source. The story was that jets of the Norwegian Air Force spotted a crashed UFO while flying over Spitzbergen on maneuvers. The craft was disc-shaped with a series of jets around the rim of the disc to make it spin. But, just 24 hours later, the military retracted their earlier statement and claimed the object they had first thought was a 'flying disc' was a weather balloon that had crashed on a nearby ranch.The media and the public accepted the explanation without question. Since then, conspiracy theorists and officials such as French have called into question the military's line on the incident.‘There were actually two crashes at Roswell, which most people don't know,’ French told The Huffington Post. Roswell, New Mexico sprang to international fame on July 8, 1947, when the local newspaper reported the capture of a 'flying saucer' by government officials in the town.Over the decades since the discovery, conspiracy theorists have insisted that the debris came from an alien spacecraft, and that the fact was covered up by the military.The continuing belief of alien activity in the area led the Air Force to launch an investigation into the crash in 1995.Officials concluded that the 'UFO' was part of a balloon launched into the atmosphere as part of a secret government surveillance programme aimed at the USSR. However, many have refused to accept that explanation, alleging a conspiracy to hide the existence of extra-terrestrial life.When they hit it with that electromagnetic pulse - bingo! There goes all their electronics and, consequently, the UFO was uncontrollable.’French, who claims he was ordered to debunk UFO sightings, said a confidential source in the military told him about the shooting down of the so-called alien spacecraft and added that there was a second crash near Roswell just days later. 'It was within a few miles of where the original crash was,' French told HuffPo. 'We think that the reason they were in there at that time was to try and recover parts and any survivors of the first crash. I'm [referring to] the people from outer space - the guys whose UFO it was. 'But other experts have rejected French's claims. 'No chance! Zero chance,' Army Col. John Alexander, tasked with investigating UFO sightings, told the website.
' In the 1980s, I was the guy developing all of the pulse-power weapons systems. We couldn't have done it then. In the 60s, they had a laser system, but your range was extremely limited, and we didn't have operational laser weapons in that time frame.But refutations have not stopped others from coming forward and contesting the military's official line. Chase Brandon, an agent who served 25 years with the CIA, recently claimed that information relating to the crash had been concealed in a hidden vault within the agency's Langley headquarters. It was not a weather balloon - it was what people first reported,' he said. 'It was a craft that did not come from this planet. On of the strangest cases involving alleged crashed UFOs, occurred nearly 100 years ago in the town of Aurora, Texas. Many people believe this to be one of many hoaxes started around this time. The year was 1897 during which the U.S. was besotted with hundreds of sightings of strange airships. The story first appeared on 19th April 1897, and claimed that a strange airship had appeared over the town of Aurora. The craft then apparently crashed into a windmill tower and exploded. Some of the material recovered had strange hieroglyphic symbols on it. Also amongst the wreckage was that of an 'alien' lifeform which the townsfolk buried in the local cemetery. Several UFO researchers have tried to uncover some supportive documentation with vary success. A few witnesses were still around when the incident was investigated around 1966 - 1977 and some of these gave evidence stating that the story was essentially true. However, most of the evidence uncovered by researchers indicates that the story is nothing more than an elaborate hoax used to drum up interest in the town. In fact researchers discovered that no windmill had been at the site in question and that the site was owned by the local mayor. Although most researchers regard this as a hoax, there are still some who pursue the case. In fact, several years ago they tried to get the grave where the alien is supposedly buried exhumed. The request was denied my the local council. This is probably the only case on record of a Hoax indirectly leading to the death of UFO Investigators. The story surfaced from Ray Palmer (editor of Amazing Stories), regarding a man called Fred Crisman who claimed to have actual physical evidence of a flying saucer. Palmer passed the story onto Kenneth Arnold, who was investigating UFO reports in the Northwest. Arnold interviewed Crisman an his associate Harold Dahl who claimed they were harbour patrolmen (their first lie). Crisman reported that they had seen a doughnut-shaped craft dump piles of slaglike material on the beach of Maury Island in Pugent Sound. The next morning a mysterious man in black had threatened Dahl, who claimed the man said 'I know a great deal more about this experience of yours that you will want to believe.'. The 2 men showed Arnold the material who in turn contacted an Army Air Force intelligence officer, Lieutenant Frank Brown, who flew up from Hamiltion Field in California in the company of another Air Force officer. The 2 Air Force officers immediately recognised the material as ordinary aluminium but did not say so in front of Arnold due to the fact that he would feel embarrassed. While flying back to Hamiltion, their B-25 caught fire and crashed, killing both officers. In June 1952 stories were beginning to come out in the German Press about an alleged UFO crash on the island of Spitzbergen, off the northern coast of Norway. The stories reported that 6 Norwegian jets were on an exercise flying over the Hinlopen Straits when radio contact was lost due to heavy static interference. At the same time the local radar post at Narvik, was showing a distorted signal of the jet fighters as well as the presence of a UFO. Whilst the jets were circling, the captain , Olaf Larsen spotted a large metallic disc in the snow which looked as if it had crashed. The captain reported his findings, which led to search and recover teams being sent to the reported location. When the teams arrived they described the craft as 150ft in diameter and that it was giving off radioactive emissions. The craft was also described as silver in colour and had strange symbols written on the outside. The teams assumed that this was a Russian test aircraft which had flown out of control. The craft was shipped to Narvik where it was examined. The results of the investigation were not released for 2 years, and the report stated that the craft was not of Russian origin, but was a craft that had not been built by any country on earth. They stated that the material that the craft was constructed from could not be identified. Unfortunately these reports were never verified and many people now feel that once again that this story is most likely a hoax. One of the most intriguing crash reports to have surfaced over the years is a report of a crash that occurred in the Air Force Base of Nellis AFB, Nevada in 1962. For many years this case was thought of nothing more than a rumour amongst UFO researchers. However, reports and statements from many eyewitnesses slowly emerged, enough so, for researchers to start digging for more information. The object was first spotted over Oneida, New York and was heading in a westerly direction. There were also reports of the object in Kansas, Colorado and Eureka, Utah. The object was the seen in the town of Reno, Nevada and was seen to 'turn' and head towards Nevada, where it disappeared over the Nellis Air Force Base. The object was also tracked at several radar sights. However, Air Defence Command, after watching the object for several hours scrambled several fighters (not something that they do for meteorites normally !). The official air force explanation was that the object witnessed was a meteor. However, this does not explain why fights were scrambled, why the object changed course, why the object appeared to land and then take off again. On 9th December 1965 hundreds of witnesses in Michigan, Ohio and Pennsylvania observed a UFO crash. It first appeared to be nothing more than a spectacular meteorite but 30 years on it is still a source of much controversy amongst UFO researchers. In March 1966, UFO researcher Ivan Sanderson compiled a detailed account from various eyewitnesses, and soon realised that there was more to this story than that of a simple meteorite. His findings indicated that the object showed a clear trajectory, moving from north-west to south-east. Its total visible journey lasted no more than 6 minutes, which indicated a speed far too slow for a meteor. Sanderson calculated a speed of only around 1,000 mph. Not all the eyewitnesses were located on the ground at the time of the sighting, there were also several pilots who spoke of being buffeted by shock waves as the large bright object sped by. This was strange as most meteorites are observed several thousands of feet above most commercial aircraft. There were also claims of shock waves and sonic booms reported from witnesses on the ground. The vapour trail left by the object were so intense that they lasted for more than 20 minutes in which time they were filmed by several people. However then most convincing aspect that Sanderson discovered to rule out the possibility of a meteorite was that the object appeared to change direction and head in an easterly direction. The object finally came to rest in a wooded area in the town of Kecksburg. The object was initially witnessed by 2 children who reported that a 'start that had caught fire had crashed in the woods'. Their mother who's first thought was that her children had witnessed a plane crash called the state police and the fire service. As soon as she had finished phoning she went out into the woods and to her surprise found that a military unit had beaten them to the crash site. This unit took command and told all civilians, police and fire department officials to leave the site immediately. The military unit reported to the police that they had found nothing, and they left.This remained the case for around 15 years when some UFO researchers 're-opened' the case. After some investigation they found out that the fire service had come within 200ft of the object before being turned away by the military. They reported seeing blue flashing lights, and noticing that the tops of several of the trees nearby were broken as if an object had come crashing through. The investigators also reported that they had found witnesses who had seen a large flat-bed truck leaving the area of the woods with a large oval object covered with sheets. Another witness indicated that he observed the military loading the object onto truck. He described the object as looking like a large acorn, with 'bumpers' on the base. He also noticed that there was strange hieroglyphics on the craft surface. The case was reported in the Project Blue Book files and indicated that 'a three man team has been dispatched to investigate and pick up an object that started a fire'. This three man team is now known to of been part of the then highly classified 'Project Moon Dust'. The official report was that the UFO was simply a meteorite. In 1990 a new witness came forward who claimed to be part of the military team that was sent in to retrieve the object. He claims that he was given orders to 'shoot anyone who got too close'. He also revealed that the object was being transported to the Wright Patterson base. The last major discovery related to a worker at Wright Patterson who claims that a strange object was shipped in on the 16th December the same year, just days after the events at Keckburg. He described the object almost identically as the other witnesses had described. Whilst he was observing the object a guard escorted him out of the hanger and told him 'that you have just seen an object that will be common knowledge in 20 years time'. In 1989 one of Bob Oeschler's sources, who called himself 'Guardian', claimed that in a area west of Ottawa a remarkable incident had taken place on 4th November. According to his source an object was tracked on radar over Carp before it fell towards the ground near West Carleton. The area was immediately sealed off and huge helicopters and military units, specially trained to deal with UFO retrievals were flown in. His source also alleged that the aliens themselves were tracked on Radar. His source provided a wealth of information. The alien craft used a pulsing electromagnetic field to fly and was built from a matrixed-dielectric magnesium alloy. It also generated cold fusion radiation. He also stated that the alien mission had a malevolent purpose. It was the allegedly the start of an alien invasion. Although the story sounded too 'crazy' to be true, Oeschler did have some 'evidence'. His source had sent him a package in February 1992. The package contained a video, several documents and maps of the area. The tape was 30 minutes long with the first 6 minutes showing actual movement, the rest just stills. The video showed strange lights, movements of 'aliens' around the craft and also a full-frontal of an aliens face!. The video was analysed and it had signs of editing, also the scenes of the craft were duplicated by researchers using a toy remote controlled helicopters, some flashing lights and some flares. They were also able to purchase an alien mask from a costume shop identical to the one in the video. Giant UFO Crash With Aliens in India Report April Fool’s Day Hoax? In a startling development an unidentified flying object said to be carrying “aliens” crash landed near Zirakpur in the early hours of Friday morning. Estimated to be the size of five cargo ships, this elliptical object that emitted an “intense white light encircled the fields before it went down with a thud. No one is believed to have been killed or injured and the area has been cordoned off by a large contingent of the Punjab police that has been rushed to the site. Right after the crash, radio signals were severely disrupted with cellphones going off the air for several minutes. Experts from the department of space and the Atomic Energy Commission, sleuths from the Research & Analysis Wing (RAW) and crack commandos of the army’s special forces are believed to be on their way to the site. Top government officials said the National Aeronautics and Space Agency (NASA), the US space agency, had been informed and senior scientists were expected to arrive at the scene soon. The Bureau of Paranormal Research & Extra Terrestrial Activities in Denver, Colorado immediately released reports of some “alien spacecraft” signals being detected in the area of the Indian subcontinent. A bureau team is expected to arrive in the city in a special jet on Thursday. First reports received from the Indian Space Research Organization (ISRO) said the recent Supermoon activity could be the reason behind “pushing” the UFO towards the earth. “The moon’s gravitational pull, which was the biggest in nearly two decades only last week, is likely to have waylaid the spacecraft,” said T Rangarajan, who heads ISRO’s special projects cell. Noted scientist Yash Pal said the UFO could probably be a “reconnaissance ship” and that there could be more such UFOs on the way. “The size of the ship that crashed in Punjab is small. It means it’s an offshoot vehicle. The mother ship could be nearby,” he warned. However, Pal did not comment when asked whether the world should be bracing itself for the kind of “alien invasion” that was portrayed in the Hollywood film ‘Independence Day’. A defence ministry official said: “We don’t have any expertise or role in respect to UFOs. Neither are we aware of the existence of extraterrestrial life forms”. The Indian Air Force, which has specialized electronic intelligence aircraft, declined to comment. The sighting of the UFO was confirmed by a farmer who, along with his son, saw a “very luminous” object in the sky nearly an hour after midnight. Daljit Singh, 45, and his son Maninder, 17, who have been living in Zirakpur for the past 15 years, said their first reaction was that it was a “shooting star”. “Maninder saw it first and even tried to snap it on his mobile,” says Daljit, claiming there were two distinct “lights” and, as they moved in the northwest direction, one of them got “extinguished on its own”. Some scholars are relating it to the 2012 phenomenon that comprises a range of eschatological beliefs that cataclysmic events will occur on December 21, 2012, which will mark the end of the world. Scenarios posited for the end of the world include the earth’s collision with a passing planet or an invasion by aliens. We hope that Apple will utilise this technology at some point in the near future, ideally with the iPhone 6S. It would be a big selling point, particularly now that Samsung's latest flagship smartphone is not waterproof.